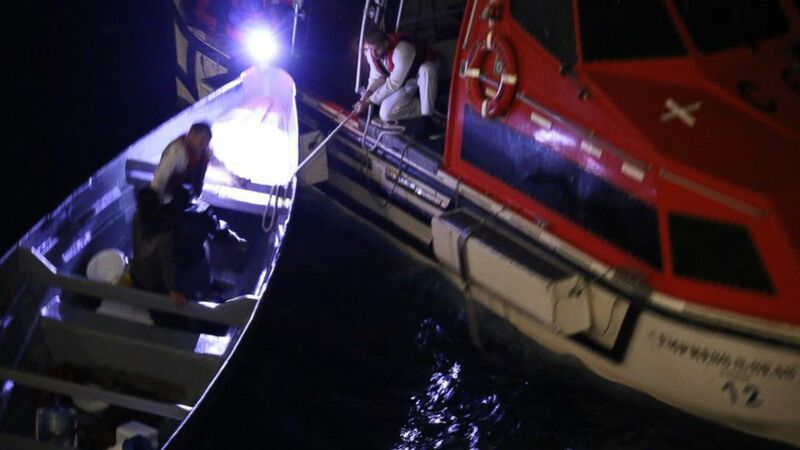 A pair of Costa Rican fishermen lost at sea for 20 days, one so weak he could no longer walk, were rescued by the crew of a Royal Caribbean International cruise ship that came upon the stranded men after altering its course to Cuba due to a storm, officials said. The crew of the Empress of the Seas came across the men about 7 p.m. Thursday night, ending an ordeal that began on Dec. 1 when they fell asleep while soaking their nets and high winds sent them adrift in the open ocean, James Van Fleet, chief meteorologist for the Royal Caribbean International, said in a statement Sunday night. The stranded fishermen were found between Jamaica and the Grand Cayman Islands, more than 700 miles from where their misadventure began in Puerto Limon, Costa Rica, Van Fleet said. The fishermen said they attempted to get back to their home port, but they ran out of fuel. (Courtesy Jared L. Eberle) Two Costa Rican fishermen lost at sea for 20 days were rescued by a Royal Caribbean International cruise ship on Dec. 20, 2018, between Jamaica and the Grand Cayman Islands. "I don't know about you, but I've already seen a Christmas Miracle," Van Fleet said. "Twenty days at sea should tell you everything about the odds of them being found alive." The fishermen, whose names were not released, were treated by doctors and nurses aboard the cruise ship and taken to a hospital when the ship docked in Jamaica. The men told their rescuers that they only had enough food and fresh water aboard their little boat for seven days, which they attempted to ration, but which ran out of before they were saved. Van Fleet said the rescue would never have happened had the Empress of the Seas not altered its course due to bad weather. (Courtesy Cary Williams) Two Costa Rican fishermen lost at sea for 20 days were rescued by a Royal Caribbean International cruise ship, Dec. 20, 2018, between Jamaica and the Grand Cayman Islands. The Empress of the Seas was headed from Miami to Cienfuegos, Cuba, when inclement weather last week prompted the captain to change direction and head for Ocho Rios, Jamaica, Van Fleet said. "Pure luck, a lining of the stars, God, whatever you choose to believe, the facts are we would NOT have been in that area at that time had we not switched to go to Ocho Rios, Jamaica," Van Fleet said. "You can't help but think there was a greater plan in all of this." Once the wayward mariners were spotted in the dark, the cruise-ship crew sent a rescue boat to retrieve them. "You could see a tiny fishing boat floating amid large swells and what appeared to be a person holding a flashlight and making an SOS signal," Christine Spadola, a guest aboard the Empress of the Seas, told ABC Miami affiliate station WPLG-TV. Spadola and her husband were on the cruise celebrating their one-year wedding anniversary, she said. "It was scary to watch," she said of the rescue she witnessed from a deck of the cruise ship. "You would see the boat almost appear to capsize amid the large swells." She said it took the crew nearly three hours to get the men safely aboard the cruise ship. "Everyone on board went crazy and was clapping," Spadola said. "It was wonderful to see such care and concern. It was a highlight and represented the best of humanity."